While Seward County Head Coach Toby Wynn would probably like to delay his teams holiday break until after a couple more key Jayhawk Conference games, he will take the way his team finished their first semester of action in 2015 as the Lady Saints easily handled visiting Pratt Saturday night in the Greenhouse 89-49 to pick up their 10th win on the season while improving to 3-1 in Jayhawk Conference action. 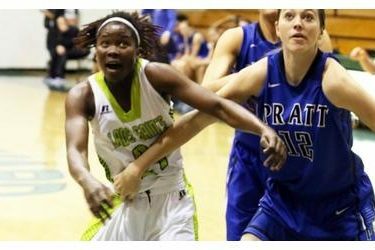 The first quarter between Seward and Pratt was a fun one Saturday night in the Greenhouse as the two teams went back and forth in an up and down first 10 minutes. Seward got out to a 9-5 lead early before Pratt found their stroke to scored 9 of the next 13 points in the game to go ahead 16-12. Seward then made three pointers on each of their next four possessions, watching Daniela Galindo, Neidy Ocuane, and Erin Richardson rain in triples to put them back in front 24-18. Another Ocuane three with time running out in the quarter would wrap up a frantic first period of action with the Lady Saints in front of the Beavers 30-21. Seward stretched their lead to double digits two minutes into the second quarter as Axelle Bernard connected on a midrange jumper and it started a 12-0 run for the Lady Saints to put them in front 45-26 in the blink of an eye. A Pratt three broke the streak, but the Lady Saints scored the final four before the break to take a 49-29 lead into the half. While the Seward offense was certainly the story in the first half, the Lady Saints defense was nothing to turn your head at as Seward held the Beavers to just one field goal in the final 8:00 of the period to build their lead to 20 going to the break. Seward finished the first half 7 for 11 from three point land, getting four of those from Galindo who led the Lady Saints with 15 first half points. After bombing Pratt with long range missiles in the first half to build up their cushion, the Lady Saints reverted to some hand to hand combat in the paint to begin the second half, getting six early points in the paint from Clitan de Sousa and Bernard to take a 29 point lead on the Beavers. Sousa then decided to try her luck from the outside and the southpaw connected from downtown with one minute left in the third quarter to give the Lady Saints a 68-43 lead heading to the fourth. Up 70-47 after a finish inside from Joanna Grymek, Bernard took over for the Lady Saints, scoring their next seven while Seward held Pratt to just a single field goal to open their lead back up to 77-48. The Lady Saints would finish the game holding Pratt to just two points and without a single field goal for the final 9:11 of the contest to run away with their 10th win of the season 89-49 at the final horn. Seward held their second straight opponent to under 30% shooting in the victory as Pratt managed just 29.7% against the Lady Saints Saturday. Seward shot exactly 50% from the field themselves while connecting on 44% from the three point line in the win. Galindo led Seward with 20 points on 6 of 11 shooting while Ocuane and de Sousa added 14 and Bernard finished with 13 points and eight rebounds. The 16th ranked Lady Saints win for an almost unbelievable 49th straight time against the Beavers, improving their overall record to 10-2 on the year while pushing their Jayhawk Conference mark to 3-1. Pratt drops to 8-5 overall and 1-2 in league action with the loss. The Lady Saints will get a couple of well-deserved weeks off after the win before returning to the court December 27th and 28th in Phoenix, Arizona when they take on Central Arizona and Scottsdale in a pair of non-conference matchups in the desert.